Southern Pecan Praline Cake is one awesome cake. A Butter Pecan Cake Mix is mixed with a tub of Coconut Pecan Frosting and more pecans. Then a spectacular Butter Pecan Glaze is drizzled over the top. This cake can certainly be served for dessert but it has the consistency of a coffeecake which makes it one awesome breakfast idea–especially for holiday breakfasts. When I first saw this recipe on Pinterest a while back, I knew I would have to make it. It sounded so wonderful and I drooled over the pictures. But then, I almost always drool over the pictures from The Country Cook’s blog. Everything always looks amazing. And this recipe was no exception. I thought it would make the perfect breakfast coffeecake for some friends who recently moved into a new home. I wasn’t wrong. Our friend’s loved it! Southern Pecan Praline Cake has quite a bit of crunch from the pecans with a nice praline taste from the cake and the glaze. 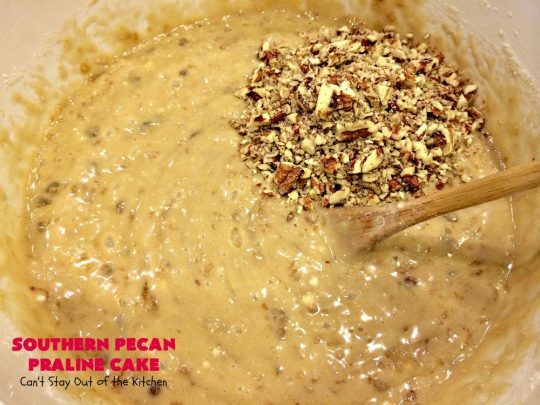 Adding a tub of Coconut Pecan Frosting to the cake mix adds sweetness, flavor and texture to the Butter Pecan Cake Mix. If you’re looking for a sensational cake for breakfast or dinner you will salivate over every single bite of Southern Pecan Praline Cake! 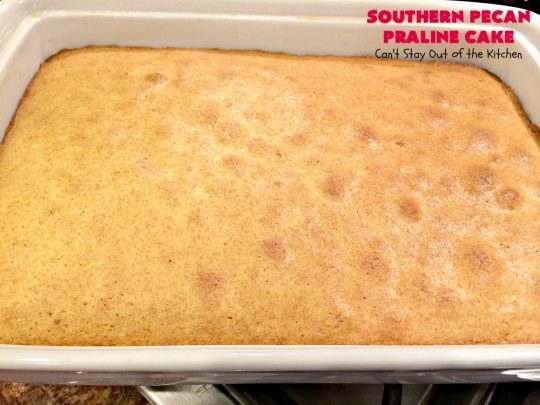 This is a great cake for company, holiday parties and breakfasts, or potluck dinners. 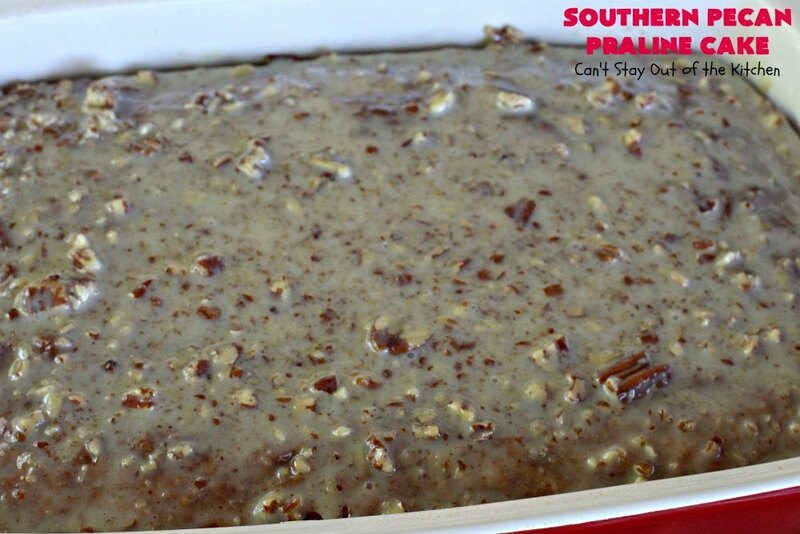 Southern Pecan Praline Cake can be served for breakfast or dessert. I loved how the Butter Pecan Glaze drizzled down the sides of the cake. 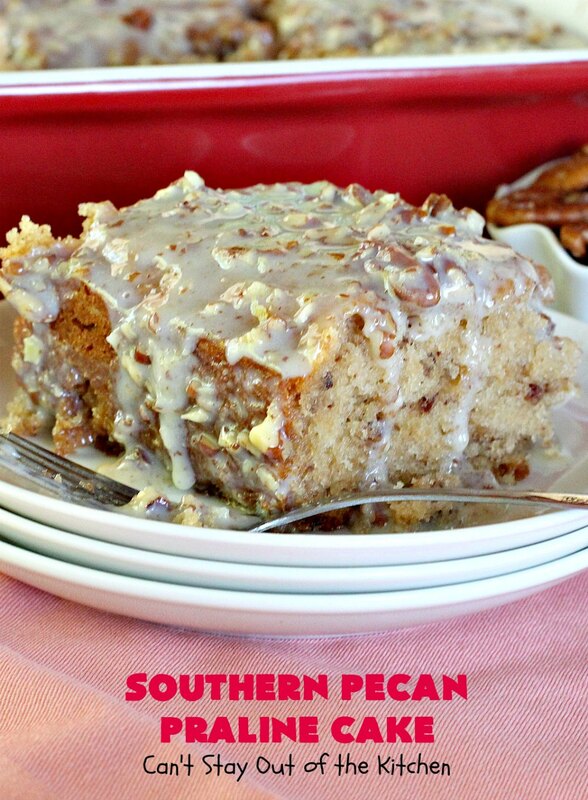 You can drizzle the Butter Pecan Glaze over individual pieces of cake, or just spread the glaze on top of the cake. Either way this cake is perfect. The ingredients on the left are what I used for the cake. The three ingredients on the right are what I used to make the Butter Pecan Glaze. 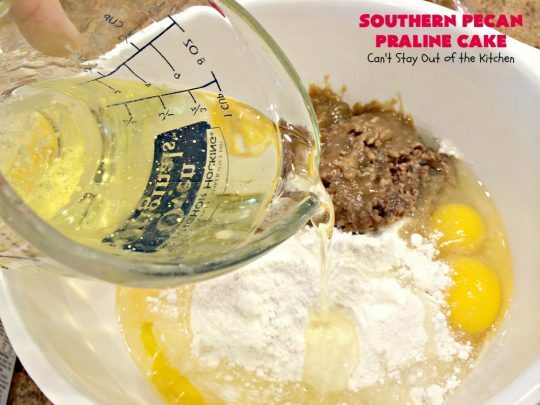 In a large mixing bowl, add Butter Pecan Cake mix, a tub of Coconut Pecan Frosting, eggs, and oil. Now add half-and half instead of water for a richer cake flavor. Stir ingredients to combine. Now add chopped pecans and stir again to combine. Spread cake batter into a greased 9×13″ glass baking dish. Bake at 350 for 30-40 minutes or until a toothpick inserted in center comes out clean. (Mine took 50 minutes). Melt butter in saucepan. Add condensed milk and stir to combine. Add chopped pecans and heat thoroughly. Here’s the Butter Pecan Glaze for the cake. I allowed the cake to cool before adding glaze. If you love pecans this is the cake for you! There is plenty of glaze for this cake. You can dollop the glaze over top of each slice! 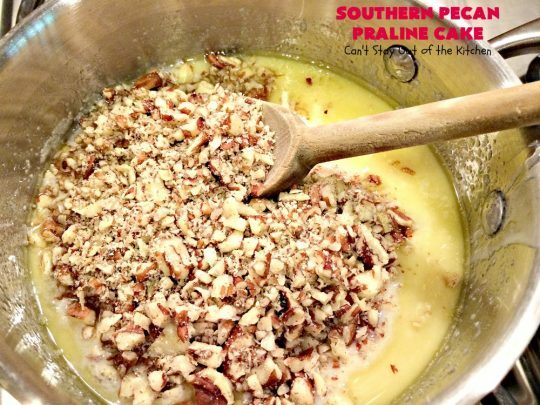 This spectacular coffeecake-type recipe is loaded with pecans and coconut and drizzled with a sweet Butter Pecan Glaze. 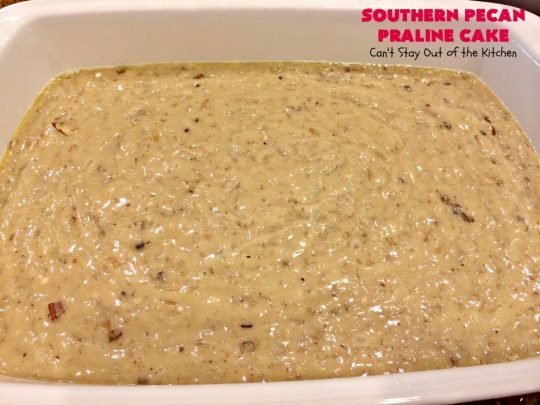 It tastes like eating pralines in a Butter Pecan Cake! It's perfect for dessert or a holiday or company breakfast since it has the consistency of coffeecake. Grease or spray a 9x13” baking dish with cooking spray. In a mixing bowl, combine all the cake ingredients except for the chopped pecans. Spoon sauce over individual slices of cake or spread over entire cake. NOTE: The Coconut Pecan Frosting is included in the cake batter. It is NOT an icing for the top of the cake nor included in the sauce. NOTE: My cake took 50 minutes to bake, although the original instructions said 30-40 minutes for a 9x13" pan and 50 minutes for a bundt pan. NOTE: I found this easier to serve by spreading Butter Pecan Glaze over the entire surface of the cake rather than drizzling over individual pieces. Recipe adapted from The Country Cook. 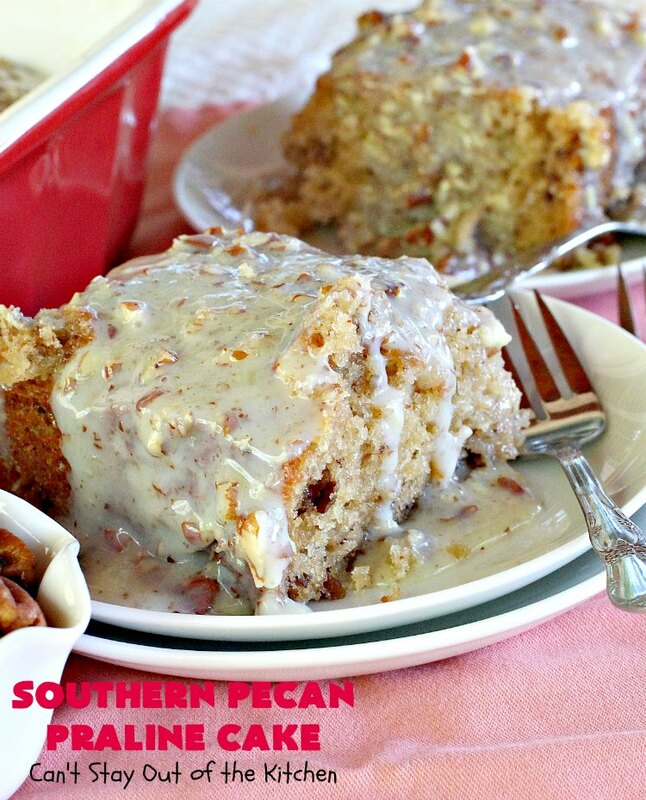 Spectacular coffeecake-type recipe loaded with pecans and coconut and drizzled with a sweet Butter Pecan Glaze. Grease or spray a 9×13” baking dish with cooking spray. The Coconut Pecan Frosting is included in the cake batter. It is NOT an icing for the top of the cake nor included in the sauce. [br][br]My cake took 50 minutes to bake, although the original instructions said 30-40 minutes for a 9×13″ pan and 50 minutes for a bundt pan. I found this easier to serve by spreading Butter Pecan Glaze over the entire surface of the cake rather than drizzling over individual pieces. I poured about half of the sauce on the cake and reserved the rest to drizzle more over individual servings. 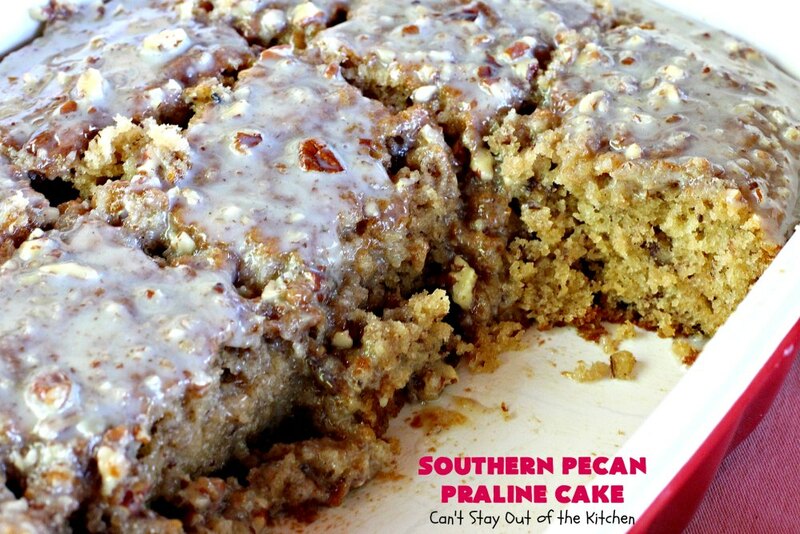 Southern Pecan Praline Cake is a great coffeecake for holiday breakfasts. Thanks. We love this recipe. Thank you for this recipe. This brings back wonderful memories of my mother-in-law. She made this as a cake bundt (no icing) and served it at family dinners. It seemed that the cake got better the longer it sat (not that it sat very long). Will try your version for Thanksgiving. Thank you for a new version of an old family favorite. Hi, Ann. So glad you like the recipe. Hope you enjoy this version for the Thanksgiving holidays. I made this yesterday and it was very good. 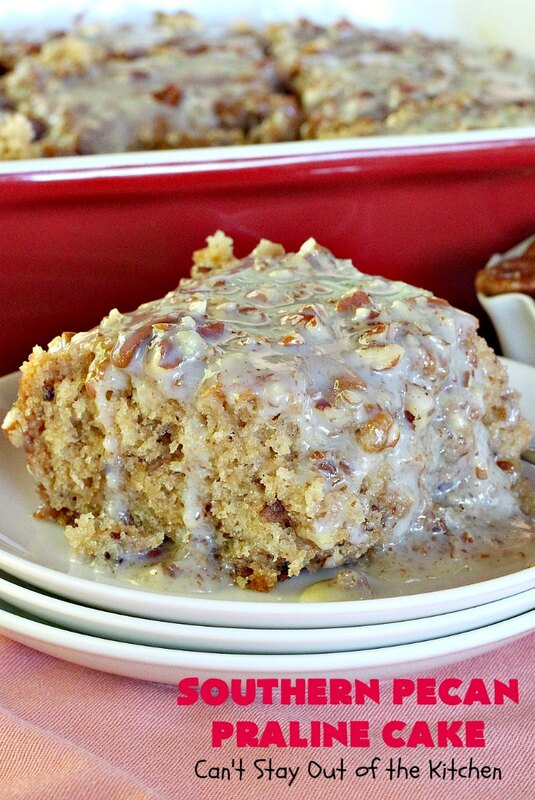 I added 2-3 handful coconut to the glaze with the pecans and it was soo delicious! THanks for sharing as this is a keeper, thank you! Hi, Arlene. Yes, I bet the coconut made it even more spectacular. So glad you enjoyed the recipe. Hey, Katalba. I think a cup is adequate, but if you enjoy pecans, by all means add more. I would hesitate to go over about 1 1/2 to 2 cups though. Thank you. That’s what I was thinking 1/2 to a cup more. Your baking notes make this somewhat confusing, I had on my list to buy a can of frosting but when I read the baking notes it made it sound like this frosting was already in the box. (It’s not.) I now understand that you were trying to point out the fact that you don’t use it as an actual frosting but Maybe admit that note altogether because it makes it seem like you shouldn’t need to buy a can, and while reading the instructions one should be able to figure out that it’s not used as an actual frosting. However I am excited to try this recipe it looks DELICIOUS! Sorry for any confusion, Joanna. I’ve done my best to try to make it clear because so many people could not seem to grasp that the can of frosting was not used in the traditional way. It is one of the best cake recipes ever! This was one of the best cakes I’ve ever had! So moist and delicious, and the pecans add some great texture. I brought it to a Kentucky Derby party for dessert, but this would also be great for brunch. The best part was how easy it was to make. Such a great recipe! Thank you so much, Sara, for stopping by and letting me now. It really is a terrific recipe. So glad you and your friends enjoyed it. 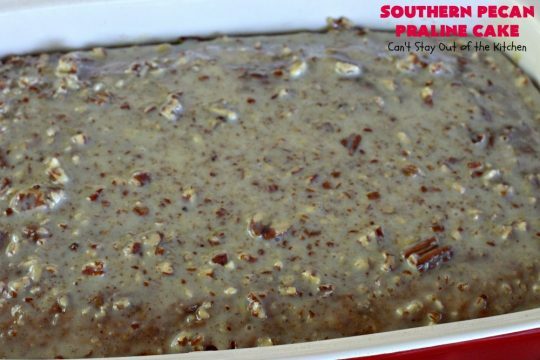 If I make the southern pecan praline sheet cake a day ahead, when should I put the glaze on? After it cools that day before or the next day when I serve it? Or does it matter? Thanks!!!! Hi, Jannine. I would put it on a day ahead, but you can probably add it the day you serve it. I personally liked pouring the glaze over top of the whole cake rather than just drizzling over individual slices. Enjoy. Thanks! I really don’t want to have to make the glaze when I’m entertaining so that works, I’ll put it on the day ahead when I make the cake! Thanks again! this cake is absolutely fantastic! I also can’t find butter pecan cake mix but have used other flavors and it’s been terrific. Also, I add a bag of coconut to the frosting glaze and its…yummy! Every time I make this I get raves!! I have seen the recipe made with water instead of half and half and I’ve made it that way myself, but the half and half really does give it a massive flavor boost! Thanks so much for this. Just wonderful! So thrilled that you love the recipe. It is one of those recipes that you can improvise on and get terrific results. Thanks for stopping by and letting me know. Do you glaze while hot? hi, Pami. You can. But I allowed the cake to cool before glazing. Thank you for sharing your recipe. Im wondering can vanilla rum be added to the recipe? Hi, April. I’m sure vanilla rum can be added with the cake mix to provide a burst of flavor. I would probably not use more than a tablespoon. The recipe calls for 4 eggs and the cake mix says 3 eggs. Do you still use the 4 eggs? Can’t wait to try it! Hi, Jo. I used 4 eggs for this recipe. It’s a terrific cake. Hope you like it. 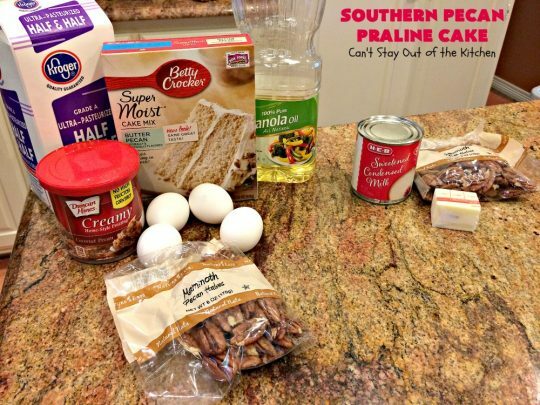 Hi, Clare, you will need to purchase a can of coconut pecan frosting that goes into the cake mixture. It is NOT used for the icing. There are other ingredients that are used for the icing. Hope that clarifies everything. Enjoy. Hi Teresa! I love this cake and have made it twice now, but, each time it burned. I used metal pans instead of glass. I can’t figure out if it’s because the pans weren’t deep enough, my oven cooks fast or the fact that they weren’t glass. I’ve had to cut all of the burnt outer parts and it’s still a delicious cake. Hi, Niesha, I really prefer cooking with glass or ceramic (although for years I baked in aluminum pans). You can pick up old pyrex baking dishes at Thrift shops or antique malls for cents on the dollar. My personal preference is ceramic, but glass is fine. I would do a couple of things: Make sure the cake is in the center of the oven. If your oven has hot spots, try to move it away from that. Also, your oven appears to cook really fast. (Mine cooks slow). So why don’t you turn the temperature down to 300 or 325 the next time you bake it and see if that works any better for you? You may have to cook it longer that way, but hopefully it won’t scorch. Also I would tent the top of the cake with foil if it gets too dark on top. You have to bake the cake longer that way, but it usually prevents the surface of the cake from over browning. One other thing, if your metal pans are very shallow, yes, the cake will bake much faster that way. You may have to shave off five or ten minutes (perhaps more) if your pans conduct the heat differently from glass. Thanks for writing, Niesha. I’m so glad you love the cake. See if any of these ideas work. Have a great weekend. Hi Teresa, this looks divine, but I cannot eat coconut. I saw that you suggested a can of vanilla may be a good substitute, but I’m not a fan of canned icing with all the preservatives. I make a good home made cream cheese frosting. do you think that would work as well? Hi, Sandy, I bet that would work wonderfully. Just remember that cooking time may fluctuate. I have also made this with German chocolate cake mix and it’s also very good. Made this cake yesterday & it was delish! Dear Husband loved it, neighbors loved it, everyone who had some loved it. 🙂 I added a little vanilla & butter extract to the batter. Not sure it made a big difference but it didn’t hurt. Will deff make this again. So glad everyone loved the recipe. It’s a real keeper! My husband loves pecans, so when I saw this recipe on Pinterest I thought about him. I made it for his birthday tonight. He absolutely loves it! The cake is super moist! Thanks for sharing this recipe. This will definitely be a family favorite! I was just wondering I just made this cake and I grabbed the vegetable oil instead of the Canola oil will this bother the cake??? Whoops!!! I just made the cake and grabbed the vegetable oil instead of Canola oil is that going to bother the taste??? Whoops!!!!! I don’t think you’ll have a problem Janet. OMG!! The best cake I have every made!!! Easy recipe!! I can not wait to make it for my friends!! Question: If I wanted to substitute the nuts for “black walnuts” would I use a different frosting since the “coconut pecan frosting” has pecans already? I may do this as a two layer cake. Hi, Jennifer, you might be able to get away with that, but I would either get a coconut icing and add additional black walnuts or get some kind of a good vanilla frosting and add both coconut and walnuts. Start with 1/2 cup each and work up to 1 cup each if needed. Hope it works out for you. P.S. Also a browned butter frosting would be good, adding the coconut and black walnuts as above. I’ve made it the day before, Karen. This is one of the best cakes I’ve ever eaten! I made it yesterday for our family Easter dinner! I’ll be making this again and again! Thank you for sharing this recipe! I made this cake for my Hubby the night before Valentine’s Day. As soon as I was done baking the cake my Hubby wanted a hot piece right away. He said it was great . I really thought this would be to sweet but it was the perfect taste. I use Trader Joes coconut oil in my cake batter. This cake is Delish. ? Really want to make this today, but I don’t have any half n half. Would it hurt to use whole milk instead? Thanks! Hi, DJ, you can use whole milk or heavy whipping cream or evaporated milk as each will provide a richer texture to the cake. I wouldn’t use 2%, skim milk, or water. Hope you enjoy it. I cannot find the frosting anywhere. Have you tried using a different type in the cake? Thank you. Jodi, I usually find it at Walmart or Kroger. Walmart even has an online ordering process where you can order online and they can deliver it to your closest store no extra charge. Amazon is another place you can find it. Hope you are able to find it. You can, but it will alter the taste and texture of this recipe. So glad you liked it, Ruba. I just made this and it was VERY YUMMY…! It went FAST….and everyone loved it…!!! Thanks, Jae. It is such a yummy, delicious cake. Does it have to be stored in the fridge? Or can it be left out at room temperature? Hi, Morgan. You can leave it out at room temperature for a day or two. Then I would refrigerate it. Thanks for stopping by. Has anyone used a regular metal cake pan for this instead of glass? I’m sure you probably can, Anne, but it may cook faster. Make sure you have a deep metal pan. Has anyone tried with a gluten free cake mix? I just found out I have to forgo wheat and these recipes are killing me, ha ha. I will give it a try and let you know. Hey, Karen, I’ve used gluten free cake mixes and they work out really well. They’re not as inexpensive, but if you want to make this recipe there are several brands now available in the stores. Make sure the frosting is gluten free, too. I made this cake according to directions and it has bubbled right out of my 9×13 pan? Has anyone else had this happen? Very weird, hopefully it still tastes yummy! Can’t stay this has ever happened to me, Mandi. How deep is your 9×13″ pan? I usually bake in glass baking dishes and never have the problem. But some of the clear pyrex dishes aren’t very deep. I try to use one with at least 2-3 inch sides. Hope that helps. This is absolutely the best cake I have ever had. I made it one time and my family won’t let me make anything else but now. We are all in love with the person that came up with the delicious recipe. Thank you so much this is a cake that is a must take to any party. I promise you will be the hit of that party. 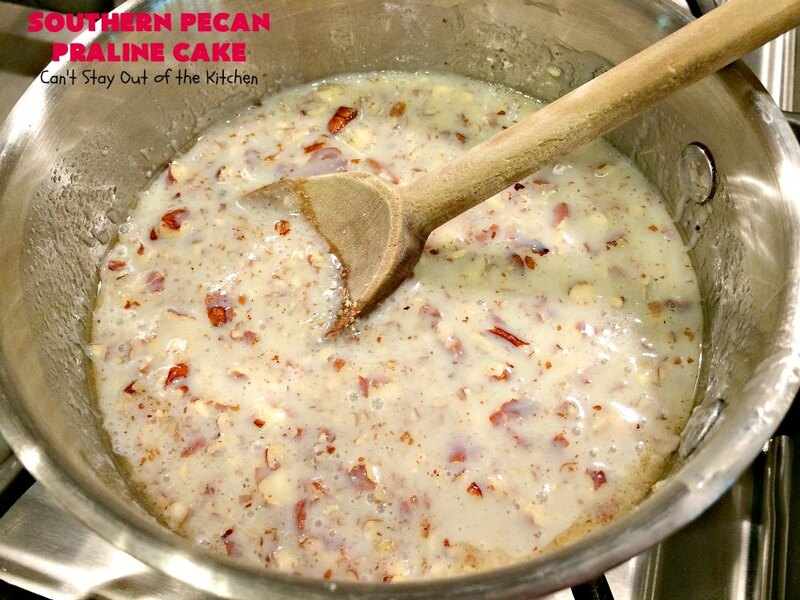 I made it with a white cake mix & toasted one cup of pecans as suggested & it was DELISH! Then today, I ffinally found the Butter Pecan Cake Mix at TARGET! I bought two for the next time (and there will be a next time)! The only thing I will change is on the glaze..I think 3T of butter is one tabelspoon too much. 2 T should be fine…it just seemed too much. But this cake is awesome & I’m not a fan of using cake mixes only when I bake. This is a keeper!! So glad you liked it Jody. It really is better with Butter Pecan cake mix. Whenever I see it I usually pick up a couple of boxes for recipes like this! They was out of the Butter Pecan Cake Mix. I seen somebody used German Chocolate Cake Mix will it taste just as good? Any help. You can try the German chocolate cake mix, Belinda but it will be totally different. 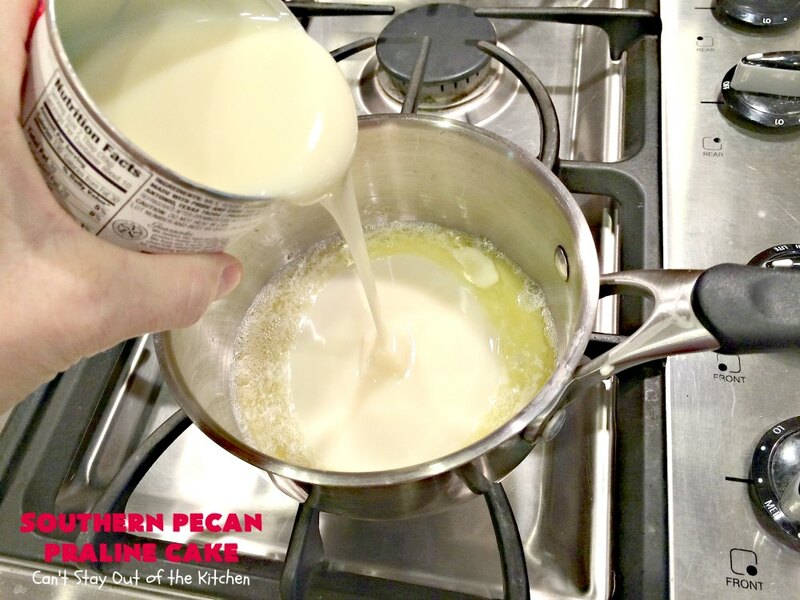 If you can find the butter pecan cake mix anywhere, you really need to try to use that. Even still, the chocolate will taste good too. I made this and it was delicious. I shared some with my coworkers and it was a hit. I will be making this for the holidays. I love the use of half n half in place of the water in the cake. It made a difference. Thank you for sharing. Thanks so much, Juanita. Isn’t it wonderful when a recipe turns out great? We love this cake too. Hi, I’ll be making this cake tomorrow for my husband’s bday. He doesn’t really like coconut though. Does the frosting in the batter make the cake have an overpowering coconut taste? Hi, Ivory. I’m sorry I didn’t see your note until now. I wouldn’t say the coconut is overpowering, but it is noticeable. Although the pecan sauce ladled over top may be so over the top that he may not notice it too much. I hope you enjoy it. Hey, Monique, the frosting gets mixed in with the cake batter. There is a separate topping for the cake afterwards. Hope you enjoy it. Hi Teresa!!! One of my staff made this cake for a staff meeting and it was a hit!!! She gave me the recipe and I have made it twice so far and everyone loved it!! My brother will be visiting this week and I plan to make it for his family!! THANKS SO MUCH FOR THIS RECIPE!!! It is the BEST cake I have ever eaten!! Thank you, Sharlet! I am so glad you and your family love the cake recipe. We loved it too, and it makes a great brunch recipe for special occasions and holidays. Thanks for stopping by. I’ve made this cake twice and can’t get enough. It’s a regular request now! 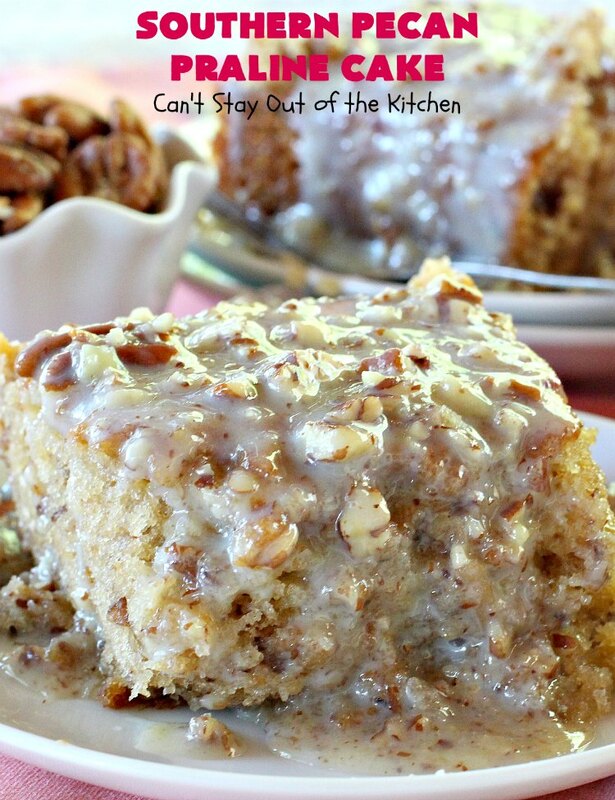 I’d like to make it for a family member who is crazy about pecans but cannot eat coconut. Is there any substitution for the pecan coconut frosting in the mix? Thanks. Hi, Becky. Thanks for letting me know how much you and your family enjoyed this delicious cake. Why don’t you consider buying a can of vanilla frosting and stirring in about a cup of chopped pecans? If it was me, I would toast the pecans in a 350 oven for about 5-7 minutes first to add a little more depth of flavor. But either way will work. See if that will work for the one who cannot eat coconut. I’m making this now.. Will let you know how it turned out!!! Can’t wait to have a piece!! It is SOOOOOO good, Miriam. I hope you and your family enjoy it. Made this for a family gathering as a three layer round cake-mixed the glaze in with some buttercream frosting to use as filling between layers-frosted the cake thinly with buttercream and pressed chopped pecans up the sides. Yep you guessed it, it was a HUGE hit. Thanks for the recipe! do you have a recipe using brown sugar, butter and condence milk or coconut milk, and pecans , coconut and or pineapple? Hi, Margaret. That would probably be my Texas Tornado Cake. I also have a Pineapple Sheet Cake that has all those ingredients, but I’ve not posted it on my blog yet. I love the idea of using round cake pans – what size pans did you use? And how long did you bake the layers? Hi, Adele. I used a 9×13″ baking dish. But I bet you could substitute two 8-inch round cake pans if you desired. Teresa, I just wanted to let you know that this is now my FAVORITE cake!!! A co-worker brought this cake to a staff meeting and everyone loved it!! We are having a family get together and this will be the hit of the meal!!! Thanks so much for the recipe! Sharlet, I’m so glad you and your coworkers enjoyed this cake. Whether you make it for breakfast or dinner, it’s a really delightful cake. Thanks for letting me know. Has anyone tried it as a bundt cake? I’m not sure how this would turn out in a bundt pan. The biggest thing is to make sure that the cake cooks all the way through. You have to stick a knife down to the bottom of the cake pan and if the knife is still gooey, the cake has to continue baking. Sometimes bundt cakes take an hour and a half to cook all the way through. As a result, the outside “crust” may be a lot tougher than this cake would be if you baked it in a 9×13″ glass baking dish. I think the biggest difference would be texture. This cake is softer and fluffier in a 9×13″ dish, but I think it would be firmer and a little tougher in a bundt pan. Just saying….. 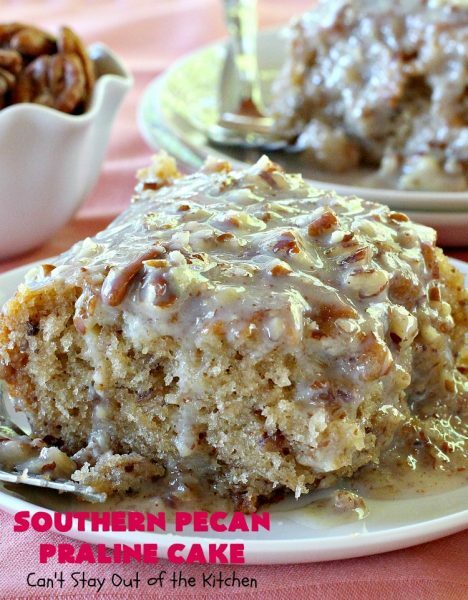 I want to make this but can’t find the butter pecan cake recipe anywhere! Can I use a yellow cake mix? Hey, Noelle. I always get my cake mix at Wal-Mart. No kidding. They stock it all the time. 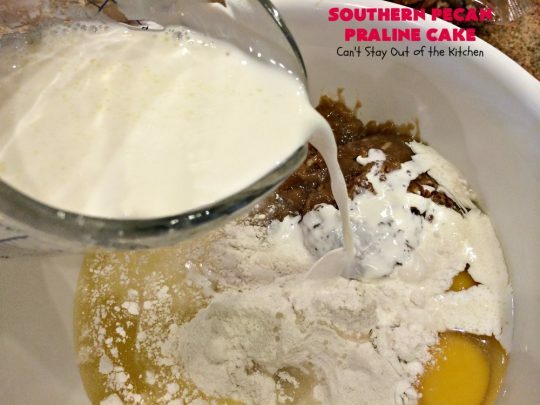 You cannot substitute a yellow cake mix, it just won’t turn out right. Here are two options. Wal-Mart has an online option where their stores will order a product for you (no charge except for the product itself). Order a couple of boxes that way and they will deliver it to your closet store and call you when the product comes in – usually no more than about two-three days. Or you can order on Amazon. Don’t try to make this with yellow cake mix, you will lose the complete essence of what this cake is supposed to be about. I hope you are able to make the cake because it is sensational. I couldn’t find the butter pecan cake mix at any of my local grocery stores & we don’t have Walmart in Seattle where I live. Since I didn’t feel like driving to the burbs to hunt it down, I simply used white cake mix and it came out awesome! I have also made this cake with a german chocolate cake mix and it is awesome! 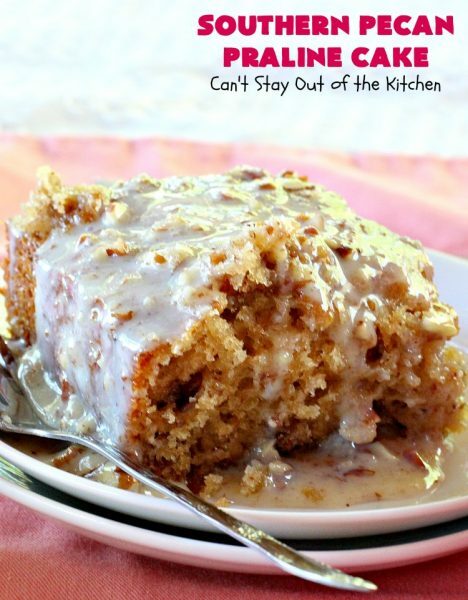 I have also made this with german chocolate cake mix and it was awesome! Do you have any nutrition info for this cake? Calories per slice? Grams of sugar per serving? Etc… Thanks! I’m sorry, Lisa, I don’t have any nutrition info. Needless to say it is probably off the charts in every area. But it is really delicious for an occasional treat! I believe you can program the ingredients into nutrition finders available online and get that info, though. Thanks for stopping by. I did a quick calorie count- about 773 calories a piece. There were about 60 g of sugar. Cutting your cake into 24 instead of 12 pieces would help keep the calories a little more reasonable. At 387 calories a piece, it is a little more feasible as a dessert. This looks amazing. Looks divine… I made it today to serve tomorrow… I am thinking it should be refrigerated because the topping is basically milk??? Also wanted to bring to your attention that the recipe says to bake for 40-50 minutes, but the step by step instructions say 30-40… no biggie… I just kept checking it 🙂 Thanks for the recipe! Hi, Bev. I’m so glad you made this scrumptious recipe. This cake is really fine at room temperature. If it was me I probably wouldn’t refrigerate it until after a day or so. I would just cover it with foil or wrap (carefully) and serve it as is in the morning. Be prepared for sugar shock (especially if you’re forking down your third or fourth piece!) 🙂 Thanks for letting me know about the times in the recipe. I’ve corrected it. Oh, Beverly, Thank you so much for letting me know how much you enjoyed this delicious cake. I love anything with pecans and the more icing or toppings the better! 🙂 I really appreciate you taking the time to let me know. By the way, I have a sweet potato custard pie on my blog to die for. This one uses almond extract and marshmallow cream. You ought to give it a try sometime too! THE RECIPE SAYS 1 CUP OF HALF AND HALF. I AM LOOKING AT THE RECIPE RIGHT NOW BECAUSE I AM GOING TO MAKE IT SOON, BUT I ALWAYS READ THE REVIEW AND I KNOW THIS IS GOING TO BE A GREAT CAKE…YUM YUM YUM, CANT WAIT TO MAKE. Hope you enjoy this cake. It’s really terrific. Looks so yummy, Teresa! Thanks for sharing this.